Today I have a short video for you. There is something that is often overlooked by folks selling their homes, and that decluttering the interior of their home. There is more to this than just tidying up. In many cases sellers will do a great job on the exterior, but completely underestimate what is needed on the interior of the home. Let’s face it; after a while we don’t even see our homes flaws (and often the messes too). It is our home. We live in it. It’s also the place where we store our stuff. Today I have a tip that will make this whole process easier. Think of it as an opportunity to shed what you no longer need in your life. It’s a great time to pare down, get rid of items that are unused and unwanted. It’s the perfect time to simplify. I can tell you from experience, it really feels good when it’s done. My biggest tip is to just start in one room. Don’t think about the whole house or you will get overwhelmed. Just finish one room and move onto the next one. Our goal is to just get rid of the clutter and organize the rest. 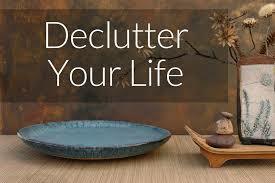 Tidying up is important, but decluttering your home goes whole lot deeper than that. The first place you need to start is in the closets. 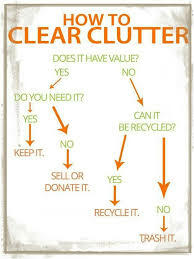 The closets in the typical home are often the 1st place we stuff unwanted items. We put off making a decision about an item and put it somewhere it doesn’t belong. Rather than stuff things in a closet so you can decide later, make it a policy to use it, donate it or throw it if you don’t use it within a reasonable time. When cleaning out and organizing closets, you want to give the appearance that you have plenty of room. If your closets are stuffed with your clothes and other belongings, all potential buyers will see is “there is no room for MY stuff in this home” and want to move on to the next house. Two other big problem areas are the garage and the basement. These are often “dumping grounds” for all kinds of stuff. 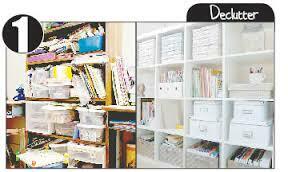 Clear those areas out so they look like large open spaces and organize what remains. Remember that this is only temporary. You’re probably going to need a storage area. In many cases if you have a lot of “stuff”(like most people do), you’re going to need to remove it and store it somewhere else. You might have enough room like a corner in a basement to just box your things up and store them in an organized manor. 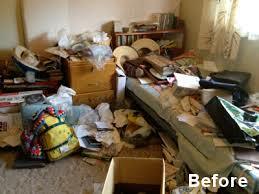 If you decide to do this, don’t make the mistake of just moving a pile of clutter from one area to another. Box it up and get it out of the way. In many cases you may need to rent a storage space or even one of those pods. Think of this as putting dollars in your pocket. Your house will sell faster if people can visualize themselves in your home. Not only will your home look better, decluttering your home will make it appear more spacious and it will be visually appealing to sellers. Check out this quick video below. Watch for more tips coming your way on how to get your house ready to sell.